Contemporary descriptions of specific paintings are rare in the critical literature devoted to Sisley. Exceptionally, A Forest Clearing was accorded a description as early as 1906, when it was included in the Stumpf sale, held on 7 May at Galerie Georges Petit, Paris: To the left, a path leads into the forest; to the right, in a harvested field, the peasants have built some haystacks. In the foreground, on the same side, a tree rises with its yellow leaves lit by the sun: and it is the sun again which floods all this patch of nature, the path, the field, the air, the blue sky, in a harmony of great joyfulness which conveys the immense poetry of this festive nature" The painting is one of only six works recorded as having been created during 1895; three represent similar rural scenes drawn from the environs of Moret-sur-Loing (see D 842-844). 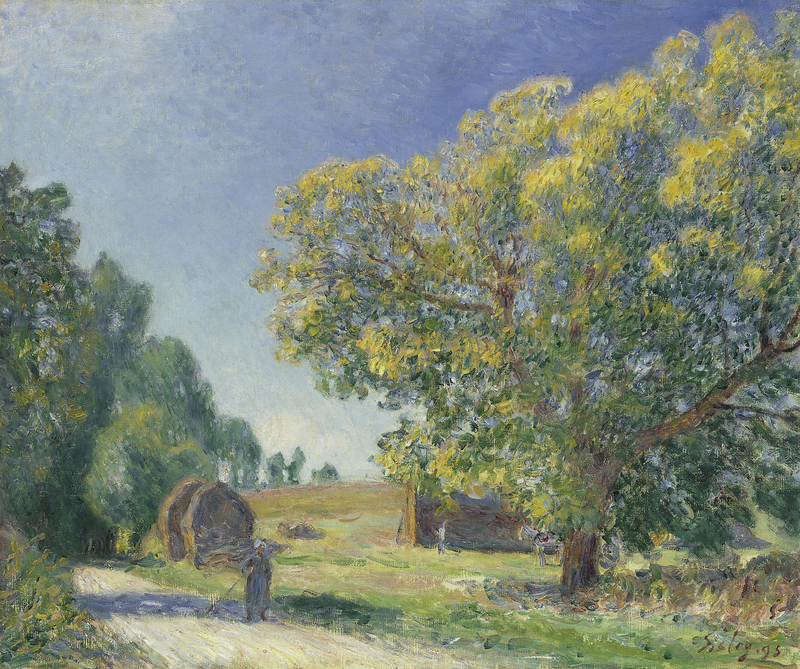 On his move to the region of Moret-sur-Loing in 1881, Sisley had embarked upon an extensive survey of the rural areas within the environs of By and Veneux-Nadon. From 1889, when he finally settled in Moret-sur-Loing, such rural views, devoid of any reference to river or canal, became relatively rare (see D 698-700, 705-711, 1889; D 735-739, 1890; D 755, 1890-1891; D 769-774; 1891). In almost all cases, deprived of the recession into depth provided by the curve of a river bank, the passage from foreground to horizon was primarily established, as in A Forest Clearing, by a path or road. Similarly, while the movement of water could convey the movement of the breeze, its absence from Sisley's non-riverine rural views demanded that the animation of the scene be conveyed primarily through the movement of the foliage of the trees. This is aptly conveyed in A Forest Clearing through the fluid, rapid brushstrokes which describe the dance of sunlight on the leaves of the magnificent arborial specimen on the right of the composition. In contrast to early practice, figures did not appear regularly in Sisley's rural views made after 1881. However, when introduced, their presence is always appropriate to the specific scene portrayed. Thus, in this scene of haymaking caught under the midday sun, a peasant woman, rake in hand, pauses in the shade cast by the trees on the left of the composition, while a small figure stands close to the large haystack, and a horse and cart, partially obscured by the great tree on the right, prepares to convey the fruits of the day's labour away from the scene. Careful scrutiny of the individual figures, horse and cart reveals that they have not been inserted into reserved areas of the paint surface but rather laid in at the end of the creative process with a shorthand descriptive brushwork over the top of the underlying paint layers denoting the field, hay stack and shadow. In this respect, the need for the figure to be "in the landscape" rather than imposed upon it, possibly derives from Sisley's observation of the role of figures within the landscapes of the English Romantic landscape painter, John Constable, whose works Sisley could have studied while in London from 1857-1860 and again in 1874. The presence of haystacks in this painting prompts comparison with the monumental series of grainstacks upon which Sisley's fellow Impressionist, Claude Monet, had been engaged between 1889 and 1891. However, although Sisley did depict this subject matter on more than one occasion, in 1889 (D 705-708), in 1891 (D 771, 772) and again in 1895 (D 844), each haystack is handled as an element integral to a larger landscape, rather than as the subject for a series of investigations into the effects of changing light and weather conditions upon a static motif. The Stumpf sale catalogue of 7 May 1906 included two forewords. The authors Henri Lapauze and Léon Roger-Milès both drew attention to the poetic qualities of Sisley's landscape art. Lapauze referred to the specific ability of A Forest Clearing to convey "the immense poetry of this festive nature." Roger-Milès expanded this specific attribute to a more general consideration of Sisley's art as a whole: "And his paintbrush has never betrayed him, because the images checked by his eyes had been checked in his heart; and that is why, as time goes by, the works by this painter, by this great artist, who has so perfectly matched the poetry of the atmosphere to the poetry of nature, will be much sought after." Even during his lifetime, Sisley was recognised as the member of the Impressionist group who, while conveying the objectively observed motif caught at a fleeting moment in time, was also the member of the group who was committed to capture the sentiment generated by a specific motif in nature, or its poetry. As early as the 3rd Impressionist Exhibition, held in April 1877, the critic Rivière noted in respect of Sisley's "great landscape, a road after the rain has stopped, with water dripping from tall trees, the damp cobbles, the puddles reflecting the sky" that he had "changed [the scene] into an enchanting poetry." Indeed, it was this sense of poetry, derived from the ability to capture both the objective record of a motif and the subjective, emotional charge which it generated that led both the English painter, friend of Degas, collector and critic, Walter Sickert, to declare that, in contrast to Monet, Sisley conveyed the "poetry of Impressionism, " and the devoted admirer and supporter Adolphe Tavernier to conclude that "the exquisite harmony of the motif and of the light of these paintings in which, in fact, nature seems to offer itself with a thrill to a direct communion. In this sense it has been rightly said that a beautiful landscape is a state of mind", thus justifying Sisley to have been "the most delicate, the most charming, the most poetic among the Impressionists."